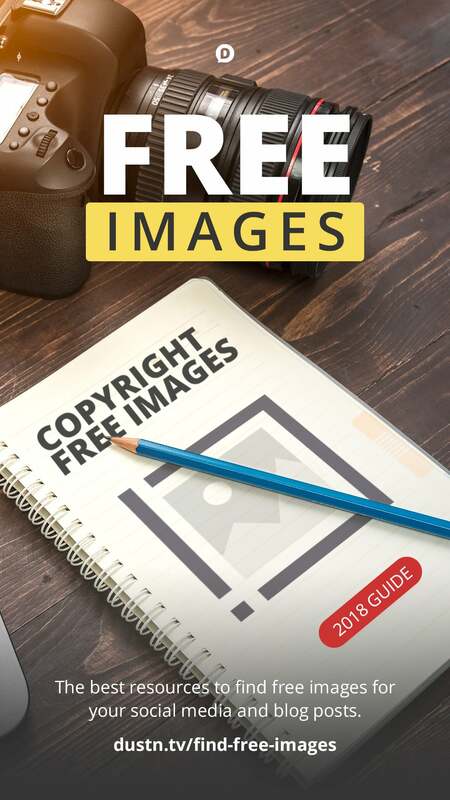 Looking to find copyright free images to use in your blogs, websites or social media posts? The following sites are the best on the internet. If you are frequently sharing images online it’s essential to have a virtual Rolodex of go-to websites where you can quickly and effectively find 100% free images. Not only that— but it’s important that you have websites in which the legal restrictions are clear and concise. Below you will find my go-to list of the best sources, hand-picked and vetted to a strict set of standards. I’ve also included some of my favorite paid resources as well just in case. This is part of the Essential Guide to Sharing Images Online series. Be sure to catch the rest of the posts in the series as well. I update this post regularly with new resources. If you want to be notified when something new is added, be sure to subscribe to my Insiders list by adding your email below. The following sites are the best places I’ve found online to get copyright and royalty free images. I have sorted through dozens of sites to only bring you the best of the best so as to save you time and potential frustration. The last criteria was mostly because I work from home and have little ones running around. Likewise, many of you reading this are probably working from somewhere where you don’t want a random piece of NSFW content to pop up in your image searches. So without further ado, here is my go-to list of copyright free image sites. This was a small free photo project that turned into an absolute behemoth of a website. 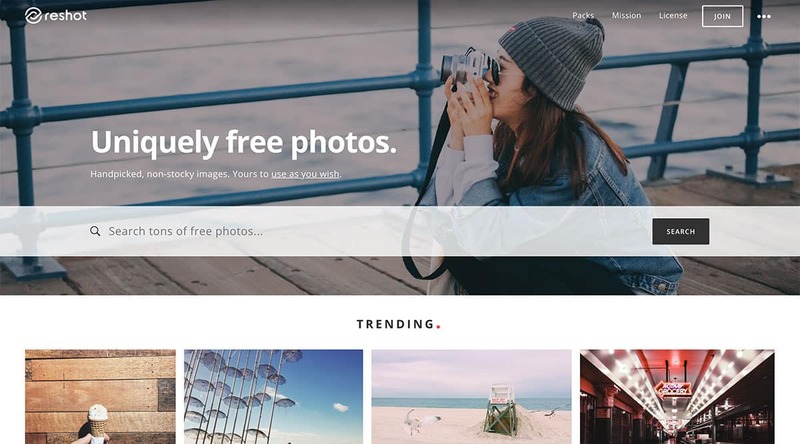 It is now one of the most popular sites on the internet and home to more free photos than you could even know what to do with. Their journey from a simple Tumblr site posting 10 new photos every 10 days has turned into a place where you could probably spend hours and never need to go elsewhere for your image hunting. The site is laid out beautifully with the ability to sort through new photos, popular collections, or perform a search for specific image keywords you’re looking for. 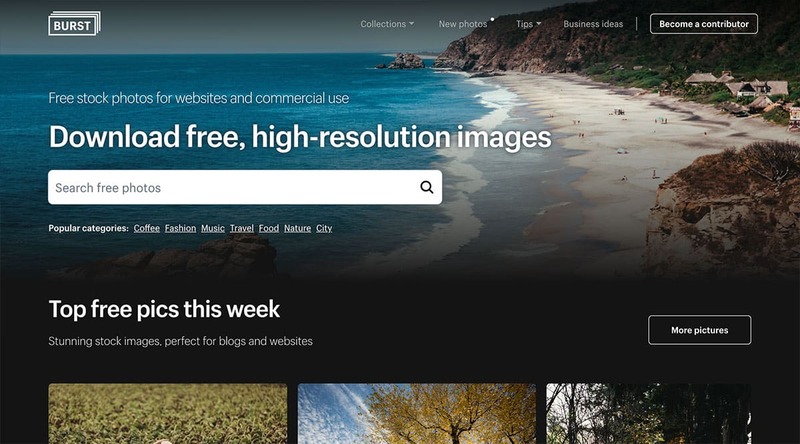 According to a representative from Shopify, the site currently has over 1,000 copyright free images and they’re adding a set or two every week. Once they start seeing what people are searching for most they will be making some “big updates” to it. 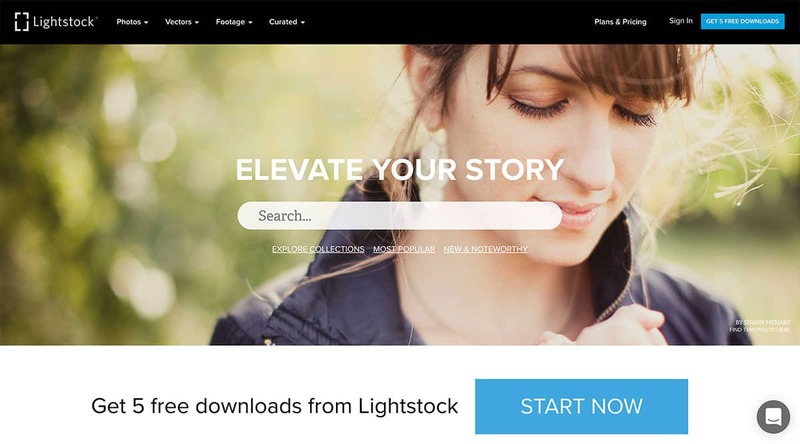 It is specifically targeted at entrepreneurs and business owners looking for stock photography, but certainly, anyone can use them. This site is a huge time saver. Basically, this site has taken and aggregated a lot of the sites I list below and pulled in their images so that you can sort through them all in one place. It’s easy to search, updates with new photos daily and has a very large library currently. Simple and elegant looking website, with a good search function that points to well tagged images. What’s interesting though, is their “Quick Image Packs” where you can download a set number of images that revolve around a certain theme. All they require for you to download these image packs is to Tweet about the site – made easy by a “Tweet to Download” button on the pack you want to get. I really hope they add to their packs as this is a really great concept, and something I find myself needing more and more. 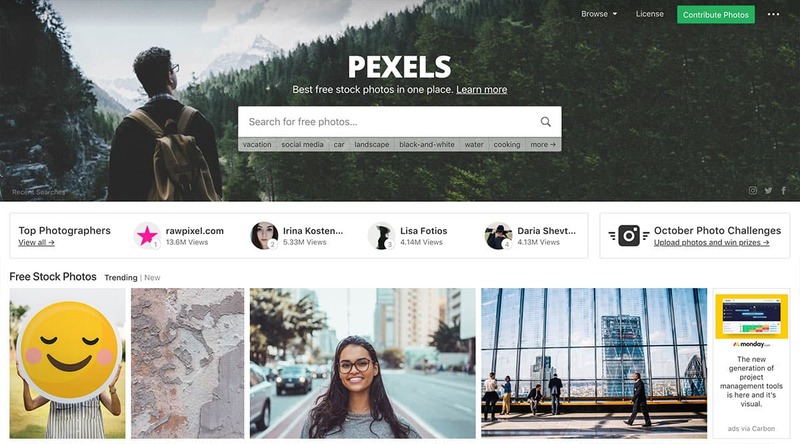 If you’d like a centralized place, much like Pexels, to search all the best copyright free image sites using an intelligent tagging system. The search engine is powerful, and when you click on an image in the search results you are taken to the photo on the site it originated from. A project of Viktor Hanacek, designer, who understands the importance of high quality images in a designer’s life. New photos are uploaded daily. Fantastic work, and completely copyright free. There is a paid membership for $6/month if you want even more from Viktor. 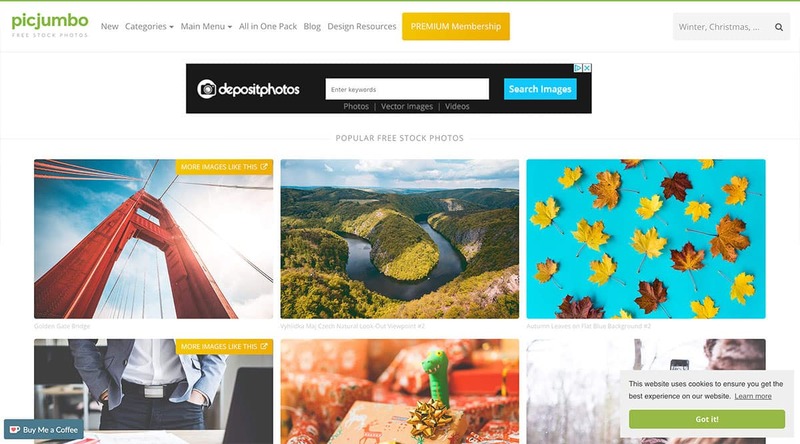 A relatively new resource, this site is owned and operated by two photographers who set out “with the hope of redefining traditional stock imagery.” They publish new, free photos every weekday and are dedicated to high quality, non-stock images. 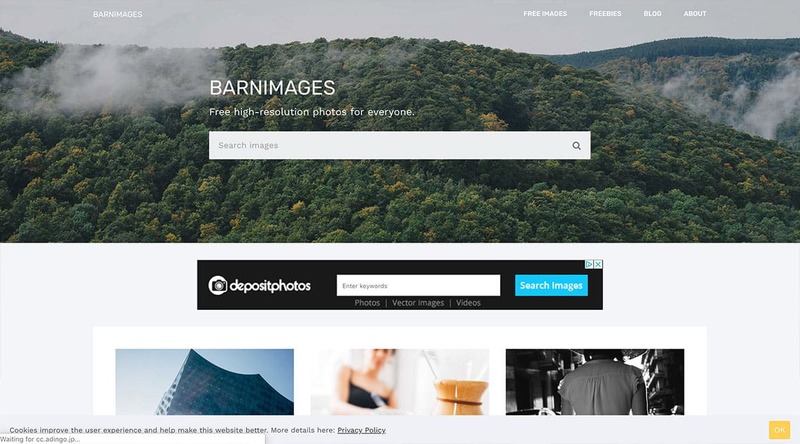 Despite the name, the site is not dedicated to images of barns, but has a vast diversity of fresh and high-quality images that are great for use with your website, blog or social media projects. A personal project of Ryan McGuire of Bells Design. Very beautiful high-resolution images added weekly, completely free of copyright. What I like most about this site is the personality and uniqueness of the photographer’s style. Very fun and a tad bit quirky. A collection of images that are personally uploaded by contributors under Creative Commons Public Domain. The site functions beautifully and has great navigation, sorting, and searching functions. 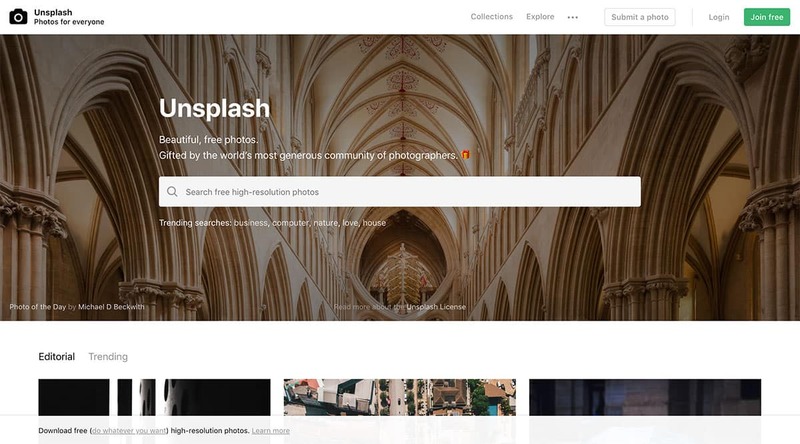 Compfight allows you to search through Flickr’s Creative Commons listed photos. It’s pretty simple to use and will automatically generate the HTML code to insert photo credit. It can be a bit buggy sometimes though, so you may be better off going straight to Flickr.com and doing an advanced search for Creative Commons photos. This is a big searchable database of free images. It also has some great filtering options to really find the photos you’re looking for. Another Tumblr powered site, New Old Stock features “vintage photos from public archives”. A great place to find authentically vintage looking imagery. Their mission is to “make the internet more beautiful”. 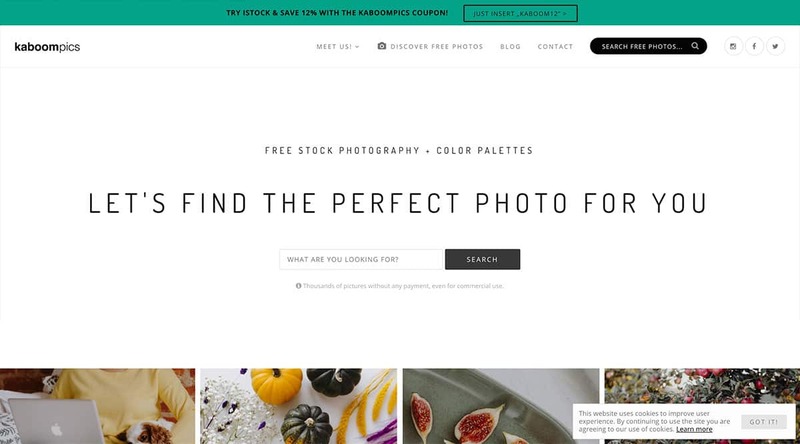 This is an email subscription that sends you free curated photo packs every month. They also do the occasional paid pack that is usually from a trip they are taking. Their photography is always top notch. Yet another Tumblr based photo archive. I recently discovered this site and love the creator’s style. No notes about how often he updates it but his only request is that you “make magic” with them. Also newly discovered, I found this site to be easy to search and photos are well tagged, much like on Pexels. Now here’s a site with a very interesting take on the world of free images– all images are organized into albums (hence the name Albumarium). Instead of searching for photos, you search for albums. This is very helpful for when you’re looking for more than one image under the same theme. Let’s say you need 3-4 photos that need to look like they were taken by the same person, or in the same setting– this site is exactly what you need. Other sites offer a similar “packs” model, but most of those are paid only. Very simple site, updated regularly with new high-resolution images that are free to use and share. The search function works well, but I’d love to see the search function work with the grid layout. As of now, when you search you only get one-column results and that can be a bit tedious. 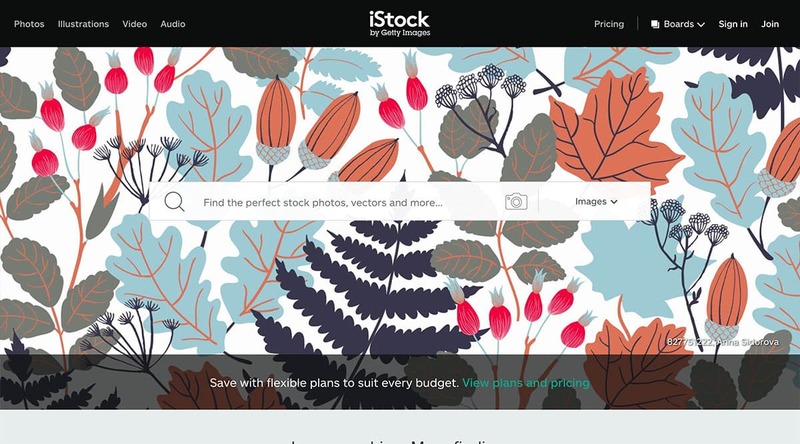 Of course, if you really want to do things in a way that’s both legal and time-efficient, you can always utilize one of the many stock image sites that offer royalty free stock photos for purchase. This is the best solution if you have a professional blog and you want the highest quality selection without any potential legal issues. 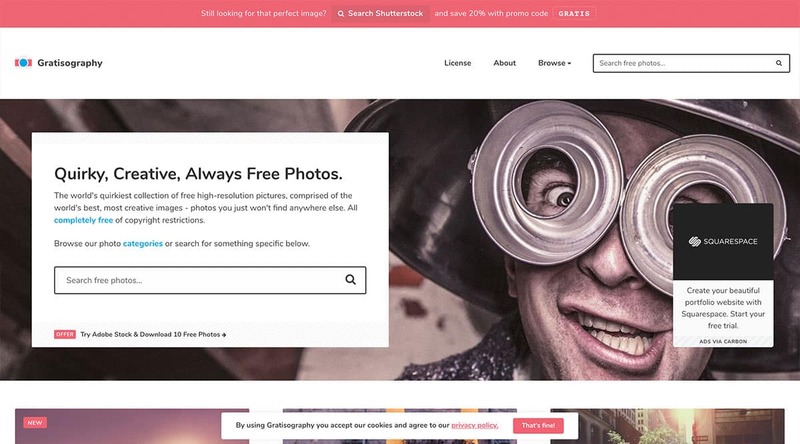 Shutterstock boasts an insane amount of royalty free images that you can purchase for a good price. They also have a wide variety of illustrations, graphics, and icons you can choose from as well. 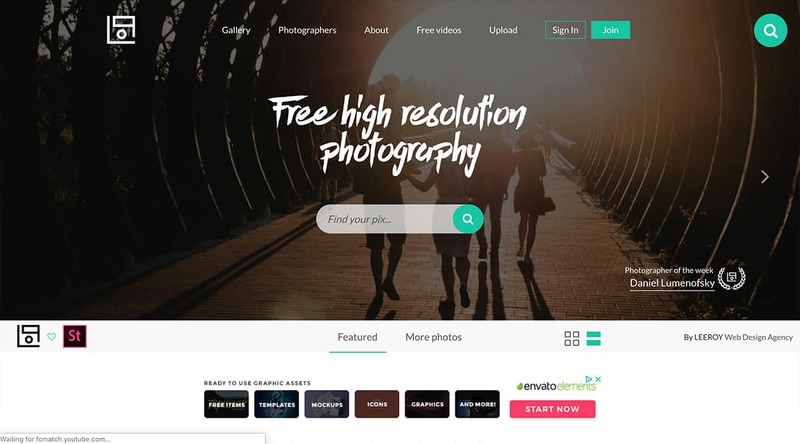 A noticeable aspect that they have is their Shutterstock Editor Pro image editor, perfect for those who want to create quick image edits for various purposes. You can make the edits right inside the web app before downloading. The leading stock image site on the internet. 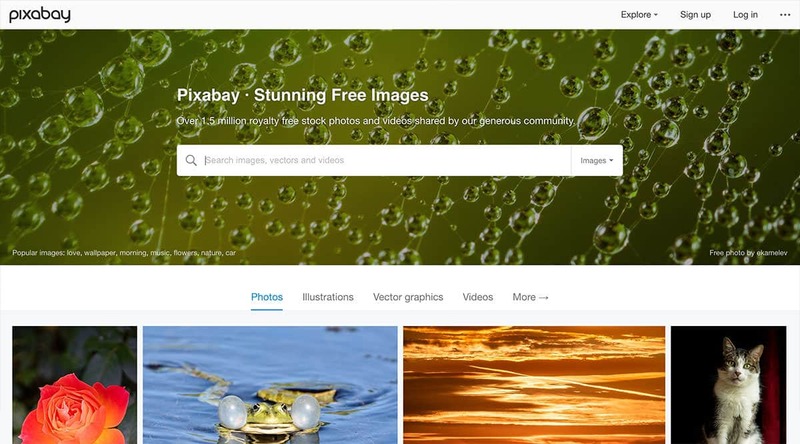 They have a huge selection of royalty free images for purchase and their search filtering options make it pretty easy to narrow down your searches. Their downside is that they use a credits system as opposed to a straight dollar amount. This makes calculating costs a bit more difficult. Not quite as big of a selection as iStockPhoto but they are my personal preference. I prefer them because the payment system is in dollars rather than credits, so you know exactly how much you’re paying for each photo. Some of the highest quality Christian photography you will find on the internet. Period. The prices aren’t cheap, but neither is the quality of the photos. If you’re looking for the best premium quality Christian-oriented photography, this is the place to go. As I was ruthlessly searching for the best sources for free images I had an idea– what better way to ensure people had the highest quality images that were free to use and share than to create them myself? So that’s what I did. I have gone ahead and created a page where I will frequently add new images for you to download, share, and use freely in your digital projects. Just visit dustinstout.com/images to see what I’ve come up with so far. It’s still a bit of a work in progress, but the idea is to make sure you have all sorts of interesting images to use in your digital efforts. I’ll be slowly building out the functionality of that page as I monitor how it’s being used and what people are saying about it. 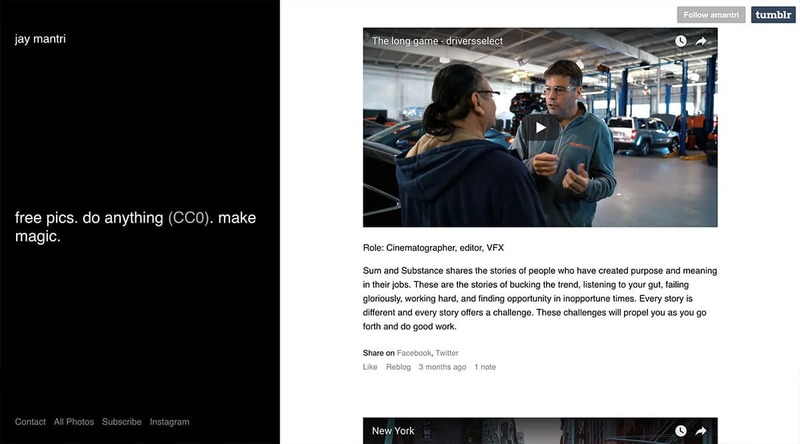 And just FYI, all images on Dustn.tv are free to use as long as link attribution is given. All I ask is that you give credit where credit is due. Fair enough? My hope is that you are now overwhelmed with sources to find legal free images to use online. Sort through your options and find the sites that work best for you. Then bookmark them, and continue being awesome. Do you have any free image resources that you would add to the list? You can leave a comment by clicking here. Thank you so much for this!! I was getting so tired of being stuck with the only option I knew of. Much appreciated! Awesome stuff! What’s your take on this new site, reshot.com? Added it to my list for review. This article is up for a 2018 refresh, so it may be added in a few weeks. Check out also Lum3n for free photos. They have a selection of modern imagery which is available only from their website and can be used for free commercially. This is a great list. I would also like to add Blend Images ( https://www.blendimages.com/free-stock-images-blendimages-community-resource ) to this list. We just launched a new program this year that features one brand new shoot to use for free each month. Is it possible to get sued by using one of the free images we find using your technique? I mean I don’t want to take any risk with my website when I’m adding images and often I had to make it’s not under copyright. But is that enough to prevent a lawsuit against a site? I’m not an attorney, so I do not give any sort of legal advice or suggestion. I would just say to read the licensing agreements on each site you’re pulling from. Most of the ones listed above are CC0, which means there are no copyright limitations on image usage. Some have a bit more nuanced licenses. A couple of other free sources which might be interesting to you are lum3n for free stock photos (free commercial use) and Creative Market creativemarket.com for beautiful graphics, fonts, and templates. At lum3n you can just download the images with right mouse click without registration. At Creative Market you need to register, but it’s worth it since you get every week six different freebies. I have found some really amazing fonts there for free. Thank you so much for this comprehensive list – Much appreciated! Another great free stock photography site is publicdomainbox.There are 7 cool new photos on each and every day. Oh, cool! Jonathan didn’t tell me he was going to do that. Thanks for the heads-up Joseph! It was a recent change. Thought it was pretty cool on their part. I used to love PicJumbo but now their site is a mess. Great collection of images. 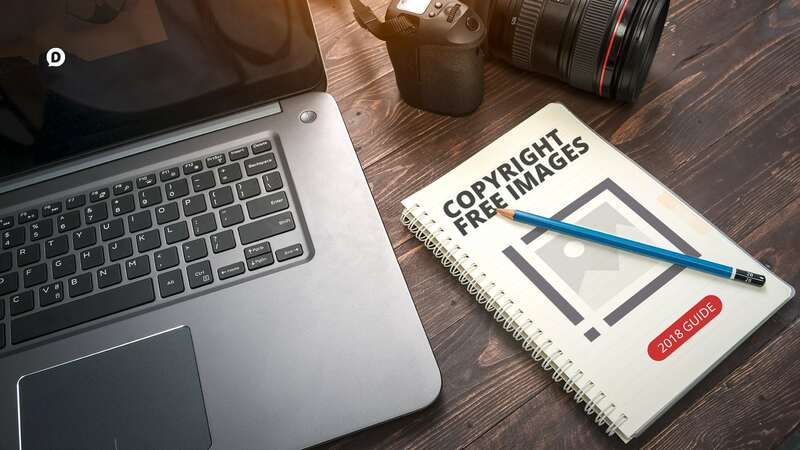 This will help us to use copyright free commercial images. Thanks for sharing valuable information. Thanks for all the great sources. Dustin, Thank you for helping me move a mountain this morning. I am excited to see what each site will deliver. This is the BEST thing I have found in such a long time. Thank you so much for pulling this resource together, it is greatly appreciated. Thanks so much for this Dustin! I feel like I’m late to the party, but party on!! I started http://fancycrave.com/ 1 year ago as a side project. 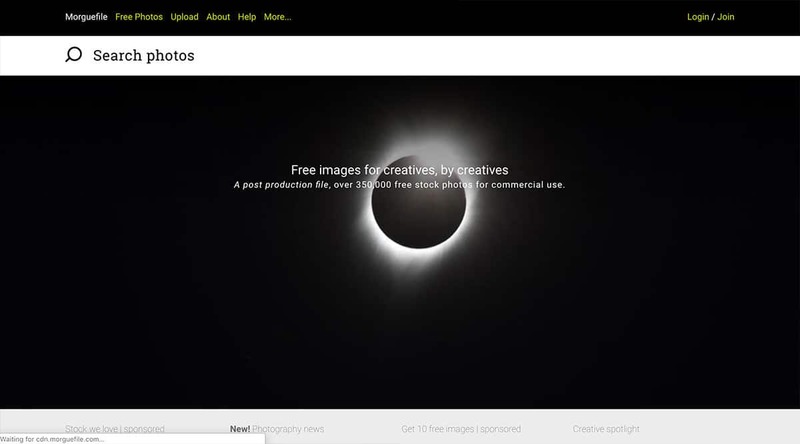 The site consists of completely free stock photos all taken by me and other professional photographers. My aim for these photos is to help designers and creative alike. People can use these images for whatever purpose they please. Each image is licensed under CC0. I keep things very simple. I list the photo, its tags, the author, and the download link. The site layout is very minimal and straight forward. We strive to publish two new images every single day. I hope you and others will find it valuable. If you see it fit, I’d be very grateful if you could add it to this list. Cheers! sure with all respective linking. Just we’re ukrainians and by local language o I would translate it if u agree on that.. However, thanx a lot 4 this great share! Nice List ;-] Look at our new website I hope you will like it Takopix.com enjoy ;-] We are adding every day 10 photos and photos are completely free. You can also use our site http://imagefinder.co, we have thousands of free stock photos mostly licensed under CC0 from various sources. Great sites, thanks for the list! I do have a question, though — I’m wondering where (and how!) to find GIFs that aren’t copyrighted. Would they be on any of these sites, or do I need to search elsewhere? I haven’t yet found a good site to find GIFs, although to my knowledge most GIFs derived from movies or TV shows fall under “Fair Use” and can be used. I either make my own from YouTube clips using Recorddit (listed in my Toolbox) or use sites like Giphy or even Buffer’s Mood Board. Ah, nice to hear movie-based GIFs are okay to use. I’ll have to check out GIPHY and Recorddit. Thank you for this – it’s rad/helpful. lol! Glad to be of help! This page is a content marketer’s dream! Do you happen to know of any kind of similar free-use sites for music? You published this post yesterday and it has been shared 32,000 times already. This is a pretty epic post. Sweet! Batman mug. I feel compelled to find a way to use that in an upcoming post… maybe “17 Things Batman Taught Us About Blogging” or something along those lines. Anyway, great job sir. Chat soon! Thanks for this great article Dustin. Some of these sites I new about but the one I am really loving right now that I did not know about is Pexels. Being a new blogger, it has been really challenging to come up with really great images to use on my budget so I am grateful for your advice and tips in this article. Glad to hear you will updating this post soon. I am looking forward to it. This is ultimate … Thanks for putting this together! Hi, thanks for this great sources. One more site for free images is https://plixs.com there are many high definition images with public domain license. This is a really good article. Are there watermarks to free stock photos? Thank you Tony! Most of the images I’ve come across that are CC0 do not have a watermark on them. Best thing to do though is just look for yourself. Recently, I’ve been taking photos for myself and I figured out that I kept those photos in my hard drive without using them for my photography portfolio or in any other way. So as maybe someone would like to use them I decided to share them for free. I lauched http://negativespace.co/. I will post at least 20 photos each monday and also I will add the raw file to every photo I would post so people can play with them. The photos are distributed without any copyright restriction under CC0 and you can search photos and sort them by category, colors and copy space position. You know Luis, since writing this blog post I get comments like this almost every single day. I end up marking most of them as spam. But I took a look at your site and it looks awesome! So I am definitely going to give it a whirl and see if it meets my high standards for inclusion in this post. I know, there are many people who have built free stock photos. I tried to contact many blogs to try to expand my traffic but seems like the train has passed so I decided to concentrate in giving high quality photos and content based on the visitors searches hoping that my content will attract visitors. Let me know if my website meets your criterias, we could make a special photo pack for your readers. Luis, thanks for sharing! I have some photos I was hoping to share also. Are you looking for contributors? If interested, let me know here. Thx again for your site. I LOVE-LOVE-LOVE Negative Space! It’s actually one of the VERY first places I check first. You have some amazing features that I’ve not found on other sites. Just yesterday I used two of your images as base photos for client posting. Thanks so much Kristin! I actually have a couple more sources to add to this list since I last updated it. Thanks for the info. Have a great day! Also http://foter.com/. On April 24 it had 228 860 217 free photos. fantastic post and useful list of resources! The website is still up, but there are no new photos being added to it. Love this list Dustin! Two more to add to your list – http://dollarphotoclub.com (membership) and a free resource I totally LOVE is http://kaboompics.com. There are also some huge time-saving resources when you need a quick image to type in the title of your post or a quote and share your content. 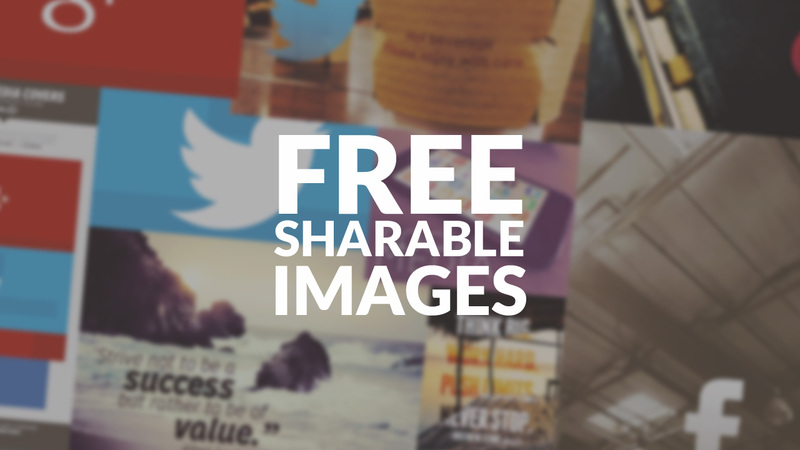 I use a tool called shareasimage.com which lets you sort through a good collection of free photos, type in your text, optimize the size for twitter, pinterest or instagram and share it there and then. That’s a good one Hitesh. I’ve also listed the free tools I recommend for creating images on desktop and on mobile devices. There’s also a new one out from Buffer called Pablo that works really well. You’re right Dustin. Pablo may not have many features as of now but I am sure the buffer team can only make it better from here. Plus it’s free I think. Shareasimage is about $12 a month but is also rich in options such as special effects, reduced file sizes and many backgrounds to choose from. Yes, Pablo is free and I’m sure they’ll be adding more to it in the future! PS : thank you you saved my life ! Glad you liked it Stacy! 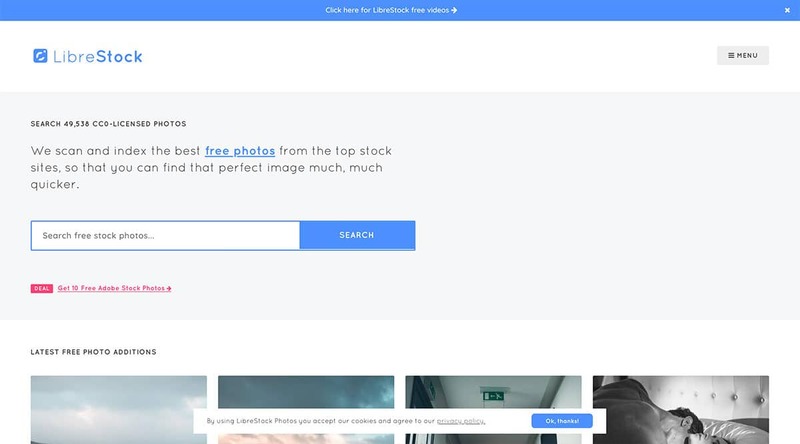 I’ve used Freepik.com but never had much success finding what I was looking for. I use Freepik.com everyday (especially for vectors) ! Thank you so much for this, super useful! Thank you so much for this! As an artist, I’m going to get a lot of use out of these, and the amount of time it’ll save me…THANK YOU!!! Dude! You are the bomb! Thank you. Great list, super useful! I always freak out about using images on the internet in case they belong to someone so it’s reassuring to find lists like this! In addition to those mentioned, I use PRShots.com loads for my blog; they have literally thousands of up to the minute PR images from massive brands in the UK. It definitely makes blogging a lot easier! Thanks Charlotte! I’ll check out PRShots! I usually use fotolia.com and they have a stock of free images in addition to the ones for purchase. I don’t know how to thank you. And if am a girl definitely will send you a kiss. Because, i ‘ve been searching for the free sites that offer images for blogging. At some point i felt like i am lack of images for my blogs. And i am a victim of the copyright images case past when am a newbie to blogging. Thank You very much for such a golden useful resources Dustin. Thank you a lot. Our designer suggest their preferences http://designmodo.com/free-photos/ we have really nice collection of free photos providers, and all are free. Thanks Lisa! Glad you found it useful! Oh my word. You have NO IDEA how grateful I am to you for posting this. I can’t even remember how I just stumbled across your awesome blog, but I’m so glad I did. As kind of a newbie in marketing (and an artist who’s super-sensitive to copyrights), I’ve spent a ridiculous. Amount. Of. Time. hunting down free image sites. At first, my heart sank when 4 on your list were already in my Favorites bar. Then POW. So many more beautiful websites than I knew existed!!!!! (Yes Ray, I had nearly resorted to flying to the great barrier reef). I don’t even usually comment on blogs – this may be my first time! And I’m gonna share this awesomeness. Maybe even Tweet it. My little graphic design heart just went *boom*. You made my week, Dustin. Another great source is http://albumarium.com – it’s a fairly fresh site, just few days old. All images are free and filterable for non-commercial / commercial licenses. I wish I found this blog earlier. I have a job in marketing without too much resources to buy images. I found some sites that are posted above, but some are completely new to me. Because photography is also a hobby of mine, me and a couple of friends decided to help out others who are looking for content by posting our own photos for free on a website. It’s like combining your hobby and giving use to the personal stock that accumilates over time. The result is skitterphoto.com. You don’t need to login, just browse and if you like something just download the original photo. By uploading, you are confirming that the Content is yours—no one else’s—and that the uploading and use of your Content does not violate the privacy rights, publicity rights, copyrights, contract rights, intellectual property rights or human rights of somebody else. If we learn that you are infringing others’ rights or are using Content that is not yours, Photobucket has the right to remove this Content and you agree that you are responsible for any costs associated with the infringement. So you can use any public photo from Photobucket for non-comercial use. Yea, the only problem is– anyone can upload anything. Upon looking at one page of the animated gifs I saw several copyrighted items that weren’t uploaded by the owners. The most difficult part of my day is finding photos and I have spent hours trying to find free images without all the CC attached. Thank you so much for making my days that much easier. I love what I do, but this just makes things a whole lot better! Again, Thank You. Thanks Dustin! Love that you shared this, as a Graphic Design and Advertising student I am constantly in search of these kinds of sites. Many people and businesses that use social media need to keep legalities in mind when using and posting photos online! Finding free images from sites where I can easily understand the terms of re-use is, for me, the single hardest thing about blogging. But no more… I had not heard of most of these sites. I am excited to check them all out. Thanks! We have a growing collection of 2300 hi res quality free photos provided by tourism promotion agencies throughout USA for use by travel press. Awesome Chery! I’m so glad you found it useful! Dustin, thanks a lot for this super cool list! As a blogger I am always on the lookout for photos to supplement the ones I take on my own and this info will come in handy. Thanks again; and ditto on: you rock! Excellent resource! I spend entirely way too much time looking for that “perfect” blog post image. I like what I am seeing on PicJumbo. Not your typical stock photos. Hey, thanks for this great list. I came across Unsplash, and Death to the Stock Photo last week and love them. My old favourite is Stock Xchng. Great I now have a few new ones for me to try. And interested in the debate about Getty. I agree with the previous comments about Canva being an awesome tool. Cheers Dustin for this list. Glad you liked it Geoff! Thanks for stopping by! Very thorough list! I’ve used several, but always nice to have more resources. Just a question, since you didn’t specifically mention copyright, but that’s why we are all trying to use “legal” images. What about your gif clip for your thank you page and the “I’m a Dustn.tv fan” minion that you’re using? Where did you get that image for your use, especially since you modified it into a poster with your own D logo… isn’t that a trademarked image from Despicable Me? Thanks for always providing great content and design. Thanks for the compliment Angelique! And to answer your question, this post may be helpful – Warning: Sharing that Image Could Get You Banned or Blacklisted. In a nutshell, yes it’s mostly about copyright. You can’t just use anything you find on the internet – in fact you’re putting yourself at high risk if you do. The Despicable me image is considered a “derivative work” which is permissible under copyright law. 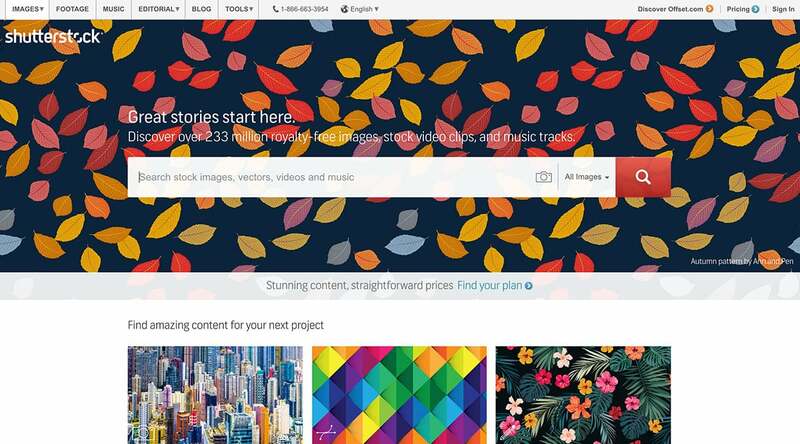 Canva, a graphic design website that’s mostly free, also has stock photos for $1, and you can use them in a variety of ways–as part of a layout (templates provided), and many other ways. It’s all drag and drop and a lot of fun to create images for my blog. But, hey, **free** is way more fun. Thanks so much. Wish I had found this list earlier. Thank you for this, perfect timing too. Might you have a follow up about apps used to edit images and quick tricks? such a great set of collection . =) thumbs up! Incredible resource. Thanks for putting this together. I will refer to this page again and again. There have been some other great sites shared in the comments that I will also make note of. I’m glad you found it useful Joshua! Thank you so much for these amazing resources! What about Creative Commons Attribution content on 500px.com? In my opinion, the quality of photography on 500px.com far exceeds that on Flickr. I also use http://www.rgbstock.com. Do you know it? What do you think? I have not heard of that Arantxa. This is great! Very informative and easy to understand. Thank you so much! Forgot to mention that I think this list is excellent, I am sure it will help me in my writing! Right Alan! I decided not to use it because I was focusing of the best images and sites with the greatest usability. I’m glad to hear that Mohd! I’m glad you liked it Henrik! Good luck! BTW, have you looked into getting a Gravatar? Thanks mate. Why yes I´ve looked into getting a gravatar. It´s just that at this point I don´t have any good image of myself that I want to use as a gravatar. And this e-mail and website are going to be “my brand” so I don´t want to use the normal kind of gravatars I´ve been using in the past. So it is on my todo list. It will change hopefully soon. Thanks so much for this incredible set of image resources Dustin. As a writer, far too often the text stands well on its own, but needs the perfect image to truly bring it out. Cheers! I’m glad you found it useful Mark! Cheers! Thanks Kara! I’m glad you liked it! This blog is an excellent reference source for images online. I really appreciate all the research work you did to put into this article. I will most definitely be checking out these various sites for some unique photos. Thanks for sharing my friend!! Thank you for the info. I’m tired of using Getty and Image exchange and was looking for a few resources when I found your post. Love the style of your blog. It’s always time consuming to find relevant images for all our writing(s). I always stick on to Flickr and sometime Behance by giving them credit at the bottom of the post. Thanks for all these resources. Another that I use for blog posts is 123rf.com – they have a full free images section that is stocked to the eyeballs with great content. The only downside is that the free images are lower resolution than some of these sources, but you can get the hi-res versions for a small fee. There are a couple here I hadn’t heard of before, so will definitely be trying them out. Thanks! Thanks Stewart! I’m glad you found some new sources! As usual, great content share! I think I only recognized two of the free photo sites and I have been in classes with video gurus for the last year. Got to add them to my bookmarks! Have you tried 123rf.com yet? I have used them before, and am going to use them for a little while longer, but may use one of the sites listed in this post later on. I have tried 123rf.com and found it to be less usable/efficient than the other paid sources I mentioned. Wow! … Thank you so much for sharing this valuable resource Dustin. I have about 15 such sites but you’ve highlighted some new ones. I hadn’t quite viewed Getty’s “opening up” their images like you but your points are quite valid – let’s wait and see what happens. Monetizing embedded images in future with advertising is a very sleazy idea (if I understand correctly) and will backfire. Hope they simply avoid that. As Ray says, finding the “right” image is the most time consuming aspect of posting so having a “quality curated” set will go a long ways to efficiency. I’m so glad you found some new resources Sanjiv! You rock! If searching for editable vector images, try Vectorstock.com. Some are free but not all. Edit with Illustrator, Photoshop. Thank you so much. Love the link to the vintage photos. Just what I need for my vintage blog! I am sharing with everyone I know. Thanks for taking the time to organize this! Woo hoo! Wow! This is an amazing collection, Dustin! Thank you so much for sharing with the growing community of people who want to do things right! Wow! Not only is this a really well-written and useful article, but the header image seems to be of a rangefinder version of my old Contaflex! Thanks for the memories. Great sources! I love your page with images to share online. Pinterest and Google+ are both really hard to find good images to use so I’m sure yours will be popular. Thanks +Dustin! Great resource. Well Done. Thanks for the free sources. I mainly use everystockphoto.com which searches 10 other sites including PhotoXpress, Morguefile and Flickr. Cool Promod! As long as it works for you, that’s what counts! Great collection, thanks for doing the legwork. Did you know gettyimages.org recently opened their collection “free to use”? Yes I did know that Charity. I have a few issues with their implementation though. They’re not responsive so they could potentially break websites that are responsive when viewed on a mobile device. They also intend to monetize the embedded images in the future with advertising– which also means they’re tracking them pretty closely. I’m also concerned about the fact that if Getty Images changes their file structure or a photographer decides to pull their photos, the blogger who embedded the photo now has a broken link uglifying their site. Thank you for the great resources. I am a blogger who is learning as I go. I have to say there is more to it then people think. It is a great outlet for my creativity for me and along the way I may help some one else. I look at it as a win both ways. Awesome Karen! Just keep moving forward and take people with you for the ride! One of the most time consuming elements of writing for blogs is the time spent trying to find that “just right” image to accompany the post. I’ve taken to using my own as much as possible, but there are times when it’s impractical to fly to the great barrier reef and snap a photo of a sea turtle. Ray, I am chuckling at the last part of your comment only because it’s so very true. I take most of my photos myself but can totally relate to not being able to find that perfect photo because I can’t hop on a plane or a boat to snap it. However, with people like Dustin helping us along the way, we can definitely include that sea turtle in our post!